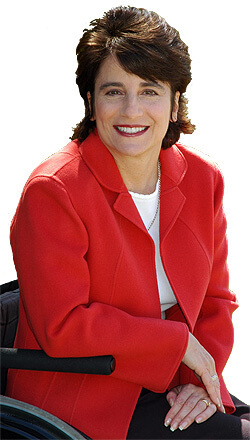 Universal Design 101 with Rosemarie Rossetti, Ph.D. The vehicles we produce are centered on an idea: everyone should have access to the mobility they require to live as independently as possible. This view is not exclusive to vehicles or BraunAbility, however, but fits into a larger movement that envelops all facets of life. The fundamentals of universal design refer to a broad spectrum of ideas meant to produce buildings, products and environments that are easily accessible to people of all physical and mental abilities. We incorporate these seven principles into every product we make, but our products only cover the mobility aspect of universal design. This year, we will be collaborating with Dr. Rosemarie Rossetti to demonstrate the full spectrum of universal design as it relates to home design. Rosemarie is the president of Rossetti Enterprises, Inc.
Rosemarie and her husband, Mark Leder, founded the Universal Design Living Laboratory, a national demonstration home and garden in Columbus, Ohio, to share how universal design helped Rosemarie took back her life after an accident left her in a wheelchair. Her life has been dedicated to public speaking and helping others live with conviction. She lives in a home created on the principles of universal design and gives tours to visitors to show others how to apply those principles themselves. The home is the modern marvel of universal design and has set a new standard for home design and construction. Google has even used their Google Maps technology to create a virtual tour of the home for people to view online atwww.UDLL.com. Click here to see BraunAbility's video tour of the house.